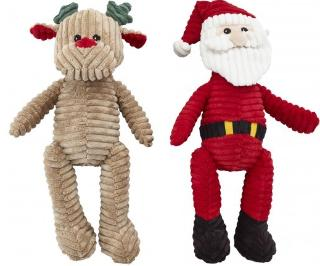 Holiday corduroy dog toys will get your pup in the Christmas spirit! These festive holiday characters have soft corduroy on the outside, with two layers of fabric and overstuffed insides for extra strength. The Santa Corduroy Character has a red suit and hat, black boots and belt, and white beard with white trim on the hat. The Reindeer Corduroy Character has a light brown body, red nose and inside ears, and green antlers. Guaranteed to add add a special touch to any holiday photos you take of your dog!